Here is the second card that I created for the October '09 issue of SheetLoad of Cards, sponsored by DRS Designs! 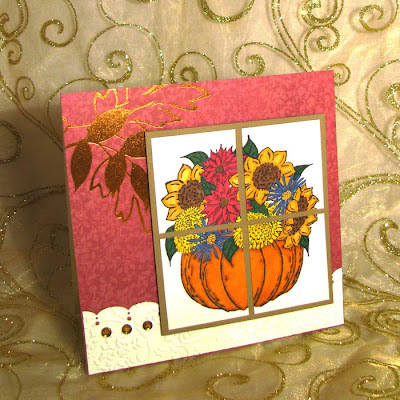 For this card I stamped the main image, Pumpkin Bouquet M684, onto Natural Ice Cardstock, colored with my Neopiko2-Deleter Markers and then cut the image into quarters. I thought it gave the appearance of looking through a window at this lovely image. If you would like to purchase DRS Designs stamps for yourself, this is the month to do it! There is a special code for SheetLoad fans on their ad inside the new issue!! Check back later this month as I share more of my samples from the issue.